Hope some of you are still enjoying your long weekend. No break for me today, so I'm back to work. I was under the weather all of last week and finally got enough energy back to be productive on Friday. So, what did I do with all that energy you ask, I cooked. I made a variety of food and if you're following along on Instagram you would have seen a picture. Although, in small quantities, I made some things I've been either too busy or lazy to make. You're almost guaranteed to find banana bread and meat pie (with chicken filling) in my kitchen. The meat pie is one of Eliana's favorite food right now, so I always have to have that available. The girl is a picky eater; I can count the things she'll eat on one hand which is quite hard when you're trying to make sure she gets all her necessary nutrients. So, in a nutshell, I spent my weekend cooking and resting, in that order. I believe I mentioned in the last post that I can't get enough of black on black. Here we are again. This time with some sequins injected. 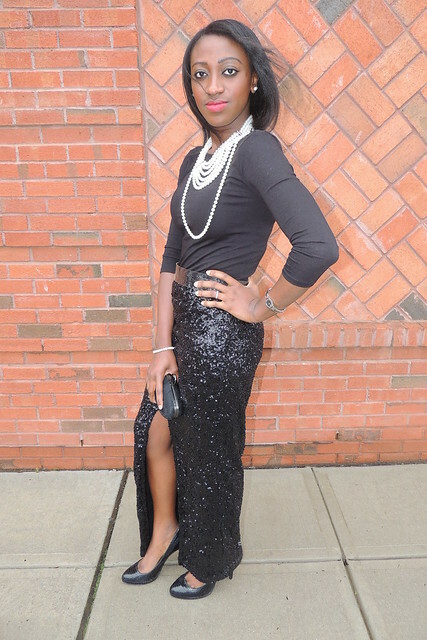 Long front slit sequins skirt and pearls just seem like the perfect match. 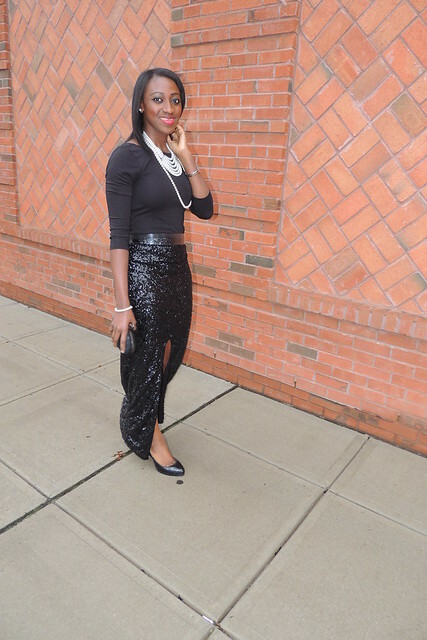 Since I wouldn't wear this skirt on just a regular day, I wore it to church on the first service of the year. That was a special event for me. I'm looking forward to the next opportunity I get to wear it styled differently. such aa glam look! love it!